soy sauce | Crappy Kitchen - Good Dinners! Have you every gotten carried away at the supermarket and bought something that is a little out of your cooking comfort zone? This happens to me when the whole place seems to exude freshness at every turn, when every display and every shelf looks colorful and inviting. I once arrived home with an African cucumber because my son begged me to buy it, and, there it sat on the counter-top that evening, while I sat looking at it flummoxed! Well, while baby bok choy is not in the same league as the African cucumber, it certainly has a way of making people feel a little confused about how to cook it. 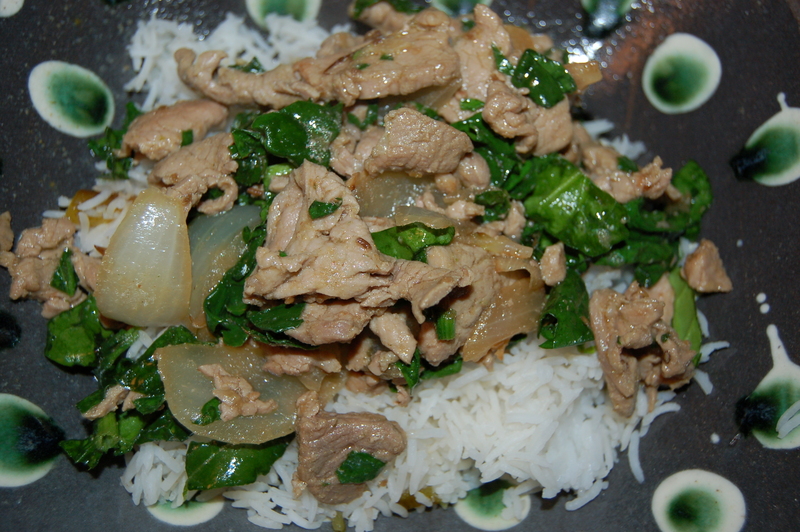 Most people think it is more for Asian cooking, buying it to add a little something different to a stir-fry. 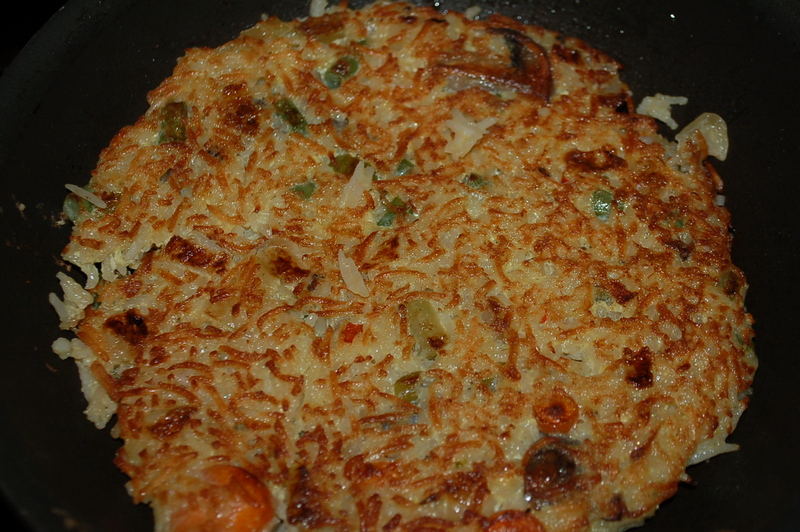 I say it can be used like any other green veggie, and can even be served whole with fried sausages and mashed potatoes. At least that is how I served it the other night! I love bok choy. 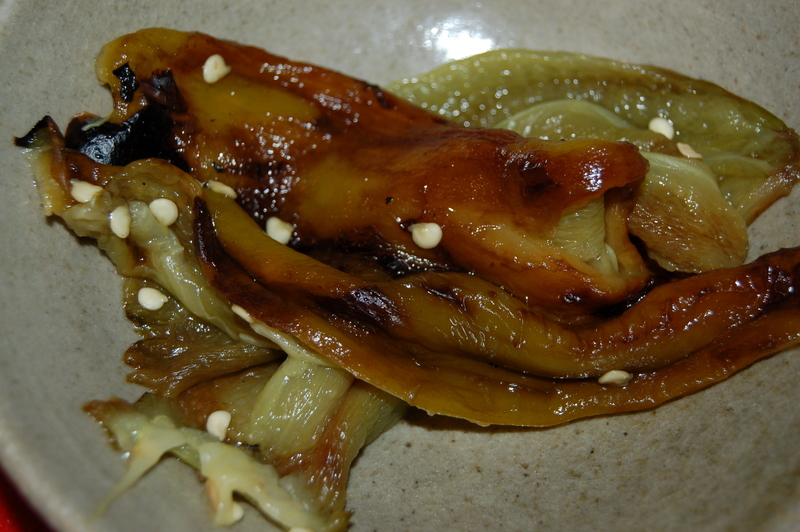 It has a great refreshing crunchy stem and the leaves, when cooked, are rich and silky smooth in your mouth. I am pretty typical in that I use it in stir-fry dishes but I also love to cook it and chop it into mashed potatoes for the Irish dish Colcannon (instead of cooked green cabbage) and finally, I love to cook it whole in a little broth in the oven or on the stove top. 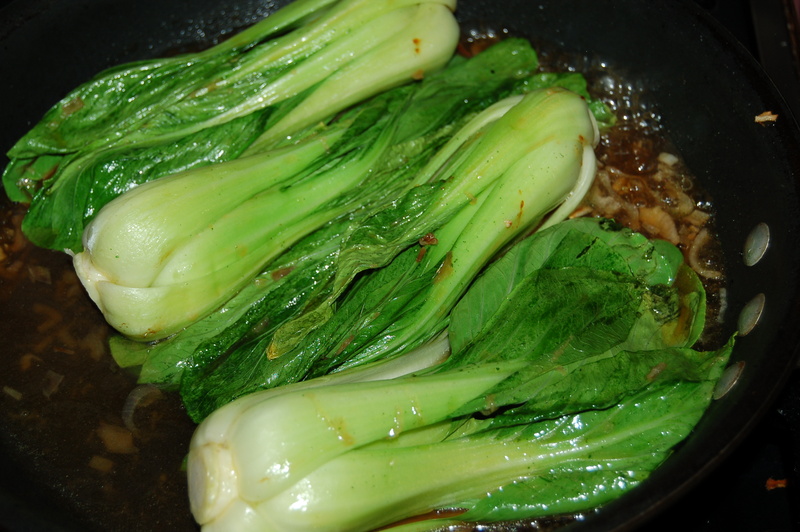 It works especially well if it is baby bok choy (just a smaller version) and everyone gets to enjoy their very own. Presenting it like this makes it feel very special and no one loves to see this coming to the table more than my kids. Time to give this not-so-common vegetable a try! 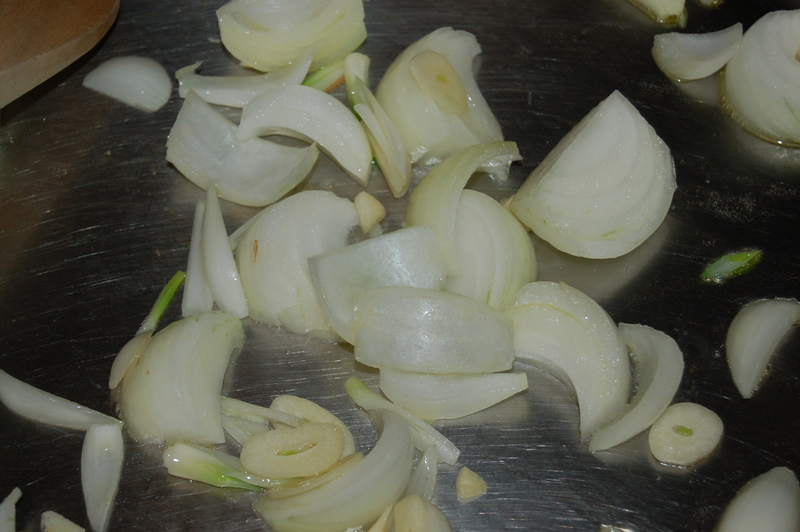 1 – Saute the chopped shallot in a little olive oil until it has softened (about 5 minutes). Use a saute pan big enough to hold all the bok choy snugly or you can saute the shallot in a small pan and transfer to a casserole for the rest of the dish. 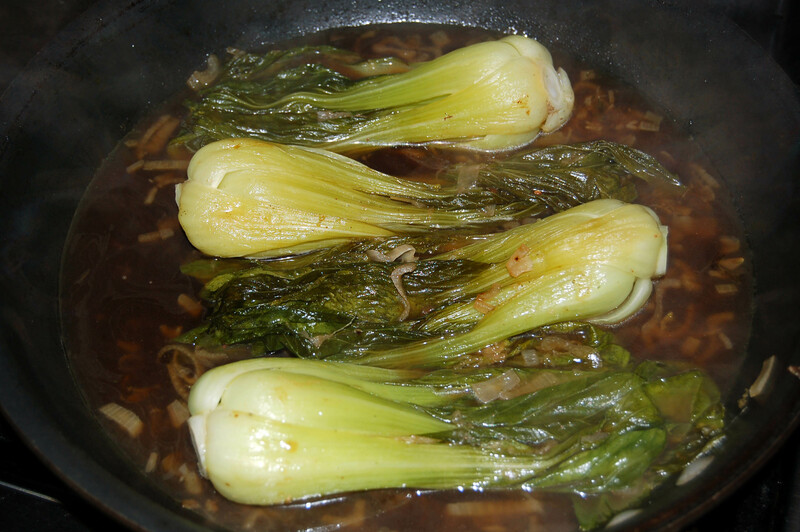 2 – Add the stock, soy and mirin to the pan (or transfer shallots to a casserole and continue with the recipe) and add the bok choy in a single layer placing each one in the opposite direction to the one beside it (cooks more evenly that way!). Drizzle with 2 tbs of oil and cover with a lid or tin foil. Place in preheated oven for 20 minutes or cover with lid and simmer on stove top for 20 minutes. Serve with anything you like. We had it with sausages and mashed potatoes, but it can be served with whatever main course you cook. Note: You can omit the soy and mirin if you want a cleaner taste. Just make sure to season with salt and pepper. Again back to the dilemma I am faced with so often in the evening; finishing work late resulting in a late start to dinner. There is nothing worse than cantankerously hungry people snapping at one’s heels. My solution for this has always been to grab the eternal bowl of leftover rice from the fridge and some fish from the freezer. This dinner can be whipped up in about 35 minutes, and pleases most palates. I used salmon, but feel free to use whatever fish you have on hand. I am not a fan of running off to the supermarket to satisfy recipe instructions. 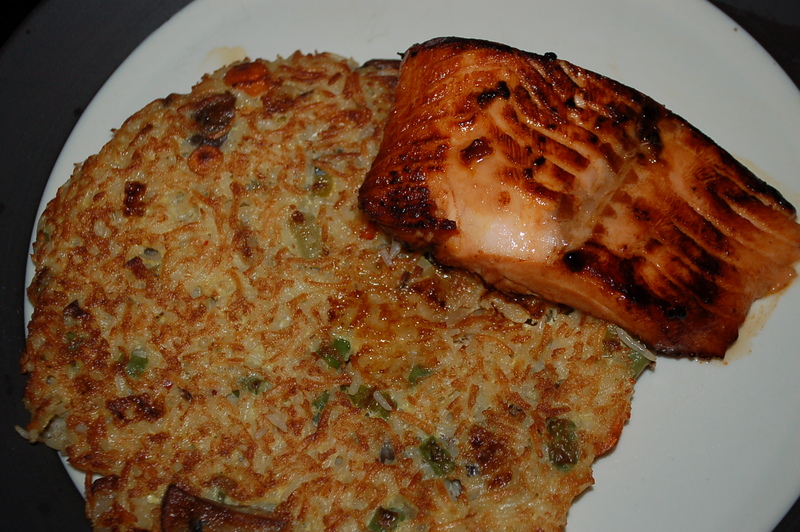 You will need: 4 6oz salmon fillets, 1/4 cup soy sauce, 1 tbs sugar, 1 tsp sesame oil (omit if Blood type A), 3 tbs extra-virgin olive oil (more for frying rice pancake), 1 lrg sweet onion, diced, 3 cloves garlic, finely chopped, 1/2 lb mushrooms (any type), sliced, 3 stalks celery including leaves, sliced, 2 medium carrots, 12 or so green beans, chopped, (or 1 cup frozen peas), sliced, 1 1/2 chicken cups stock (or 1 good quality veggie stock cube and 1 1/2 cups water), 1 tsp cayenne pepper flakes (optional), 4 eggs, beaten, 4 cups cooked basmati rice (a good way to use left-over rice), salt and freshly ground black pepper as needed. 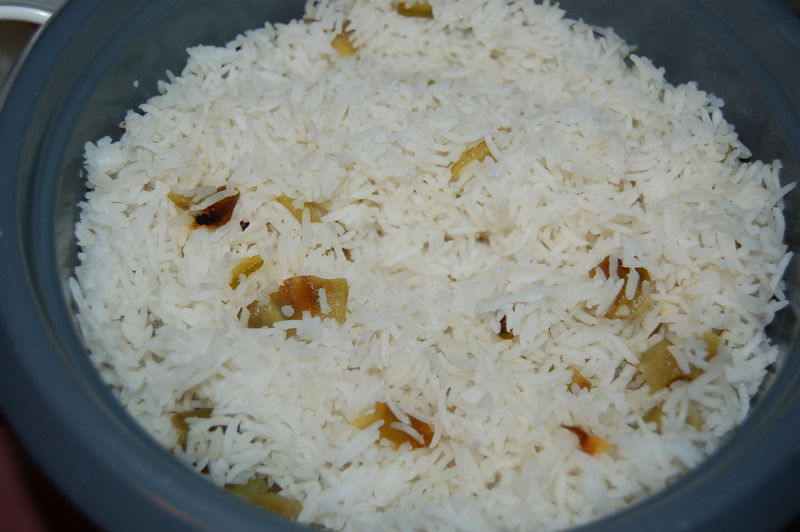 2 – If you have no cooked rice, cook it at this point. 3 – Prep all veggies and put big saute pan on medium heat. 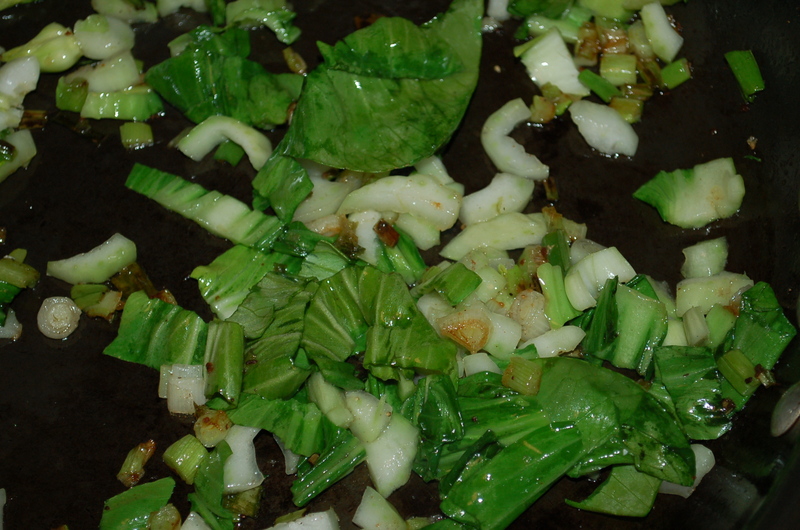 add oil and add the celery, onions and garlic. saute for 5 minutes. 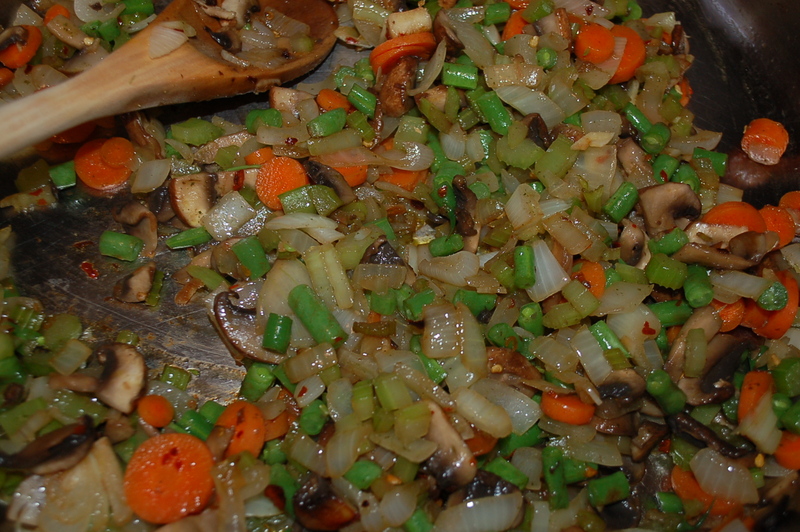 Add the carrots, mushrooms, green beans (or peas), and pepper flakes and continue to cook for another 10 minutes. 4 – Add the stock (or water and stock cube), and bring to a boil. Simmer for a couple of minutes. Taste for addition of salt and pepper and add according to your taste. 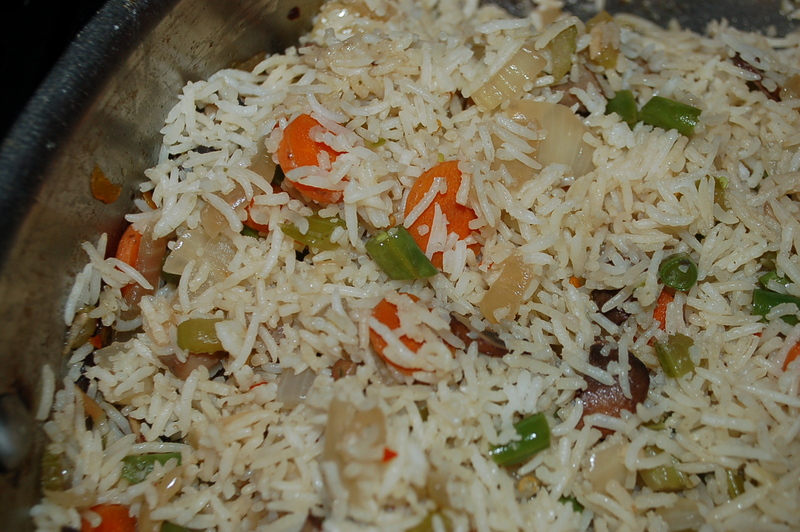 5 – Add the rice and stir. Turn off pan and set aside. In large bowl, beat the eggs. Add the rice mixture and stir until incorporated. 6 – Wipe pan clean and put on med to high heat. Add 3 tbs oil and when it is hot arrange fish on pan. Fry on both sides until cooked through (about 3 to 4 minutes per side). Remove to a place and keep warm. 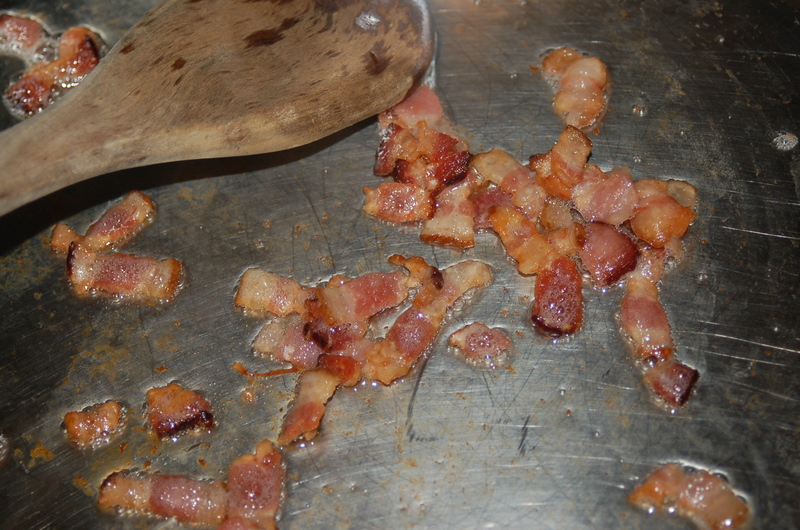 7 – Put small pan on med/high heat (I used an 8″ pan & it can be non-stick) and add some extra-virgin oil to coat the pan. When it is hot add a big scoop (1 1/4 cups) of the rice mixture and flatten down gently to cover the entire surface of the pan. Fry for 3 minutes, flip and fry on other side until lightly browned. Remove to a plate and proceed with the next pancakes. Serve each person a pancake, a piece of fish and a drizzle of juice (this juice is from the fried fish after it has rested while cooking the rice cakes). Listen, the world needs more tofu recipes, so bear with me. This is really a very good dinner! I am as fond of meat and butter and decadently rich food as the next person, but I have to admit, there is something about tofu that makes me want to convert anyone who will listen. It can take on all sorts of flavors, and holds up to frying, braising and lengthy marination. It goes particularly well with soy sauce, which is the base flavor for this dinner. Give it a try. It’s cheap, quick and not half bad. 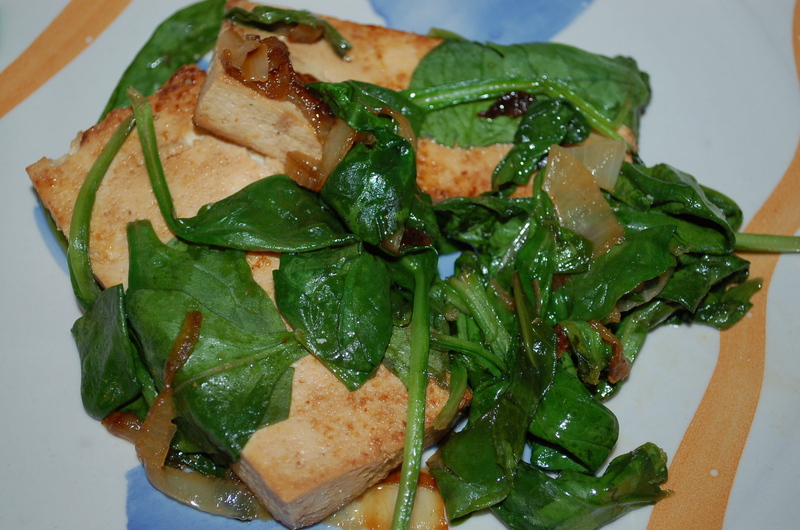 You will need: 14 oz extra-firm tofu, sliced into 8 pieces, 1/4 cup soy sauce, 3 tbs mirin, 1 tsp sugar, 1 onion, sliced in half and then into 1/2 moon slices, 4 cups spinach leaves, 4 tbs extra-virgin olive oil. 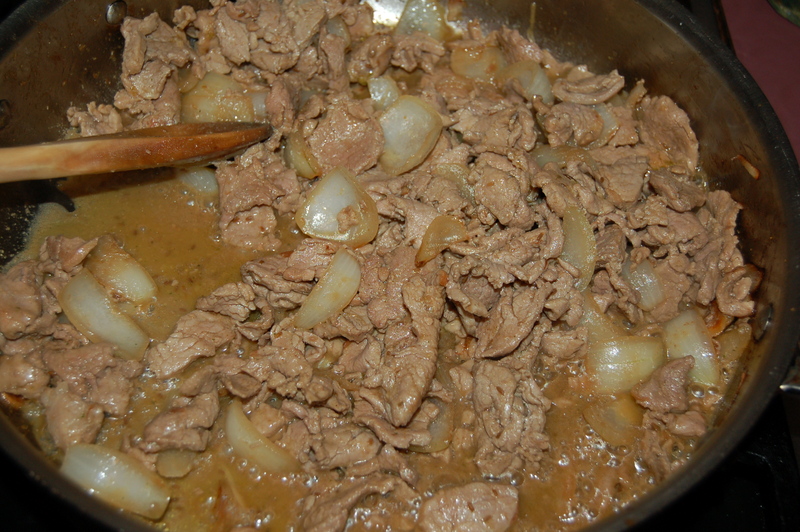 1 – In shallow dish or casserole, combine soy, mirin and sugar. Add the tofu slices and marinated for at least a 1/2 hour. 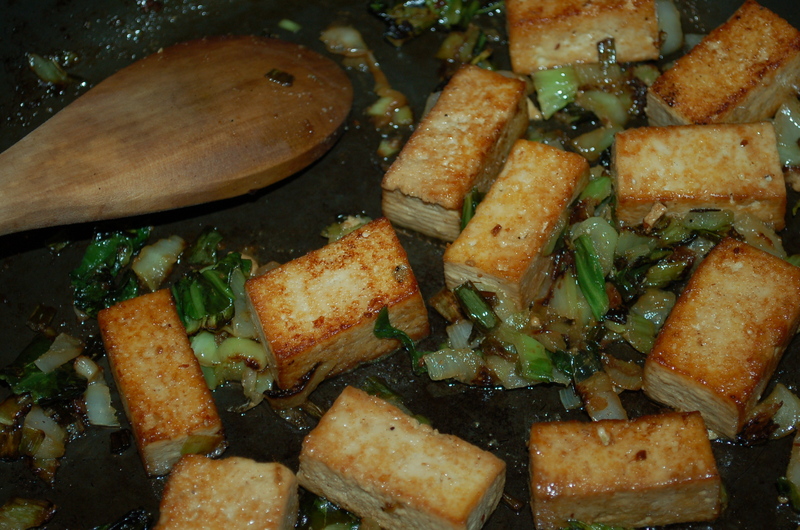 2 – While tofu is marinating, slice onions, and put large saute pan on medium heat. 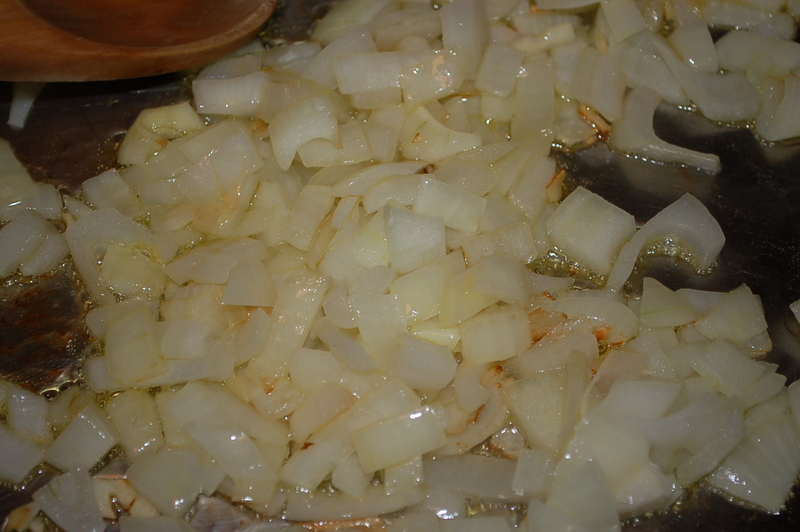 Add 2 tbs of oil and saute onions for about 10 or so minutes. 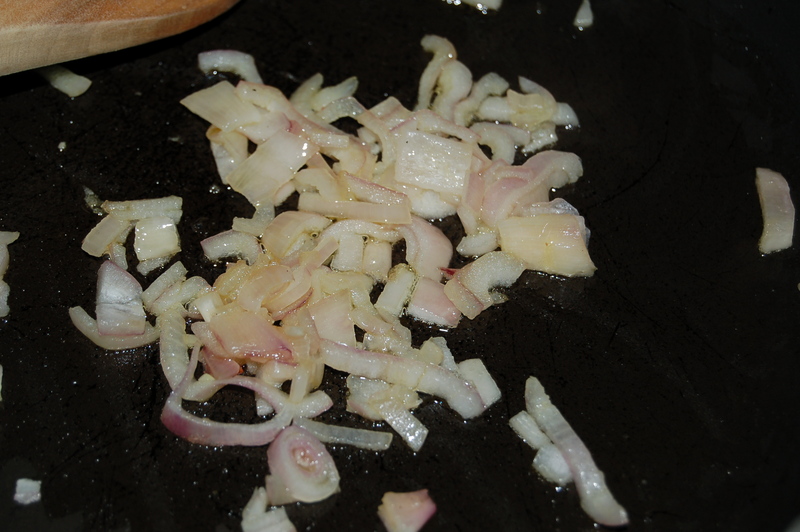 3 – Turn up heat, pile onions to on one side of the pan, and add more oil. Fry tofu on both sides until golden. 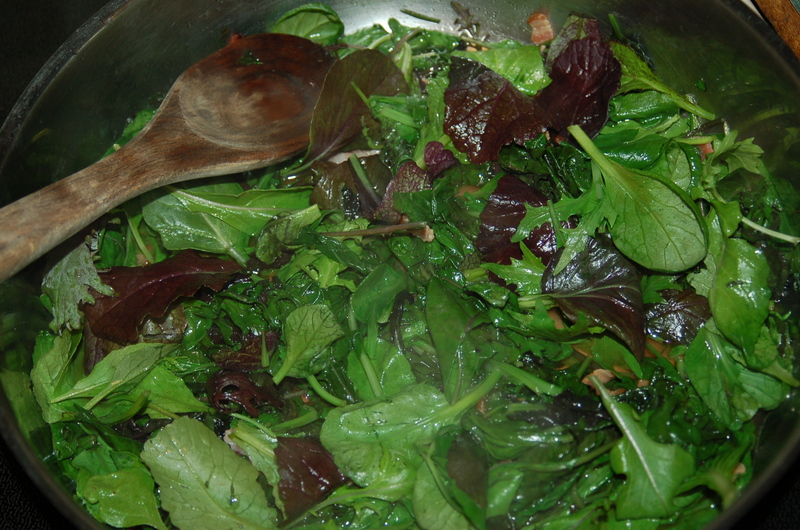 4 – Turn heat down to medium and add the spinach. Cook for about 3 minutes. Add the leftover soy marinade to the pan and turn off heat. 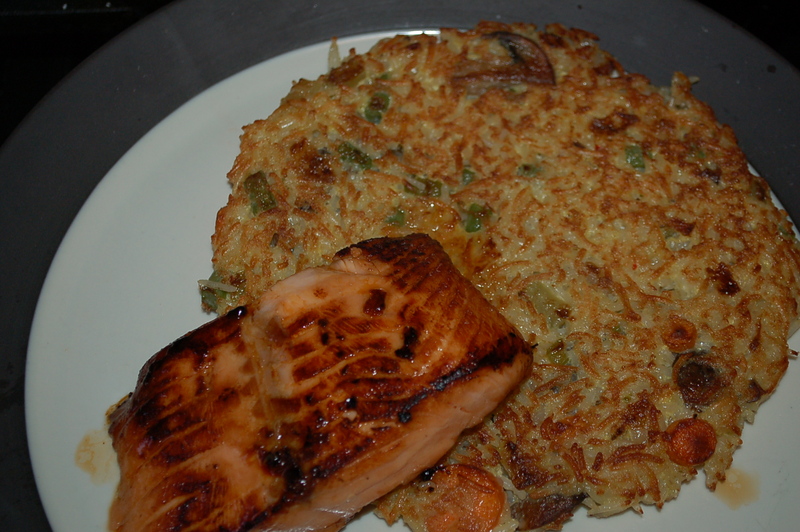 Divide between 2 or 4 plates depending on whether this is a main course or appetizer. Add some sriracha sauce if you are so inclined. This tofu dish has minimum ingredients, but is not short on flavor. Nothing could be simpler to put together. If you marinate the tofu the night before (or in the morning before you get on with your day), this meal will come together in 15 minutes or less. It may even turn you into a tofu-lover! 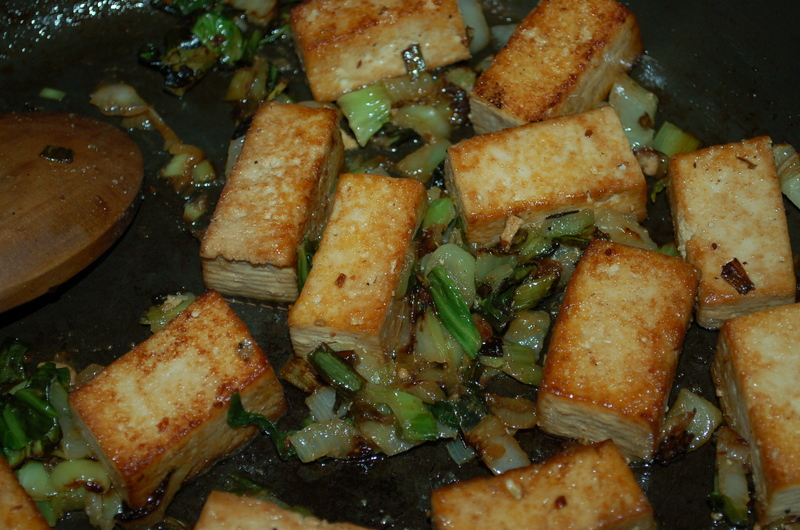 You will need : 1 container extra-firm tofu (usually 10 oz packs), 2 tbs extra-virgin olive oil, 4 scallions including green parts, sliced, 1 baby bok choy, sliced, 4 tbs soy sauce, 1 tbs sugar. 1 – Squeeze excess water out of tofu by placing the block of tofu on a plate and stacking about 4 dinner plates on top of it. Leave for about 20 to 30 minutes (in the meantime, prep the rest of the ingredients, and possibly do a load of laundry!). Pour off water and cut the tofu into very large cubes. Add the soy sauce and sugar to a plastic lidded container and toss in the tofu. Put lid on top and give everything a shake to coat the cubes all over. Leave for about 20 minutes (or can be done much earlier and left in the fridge) shaking every now and again. 2 – Put large saute pan on medium/high heat and when it is hot, add the oil. Stir-fry the scallions and bok choy for about 5 minutes. 3 – Move the veggies to one side of the pan and add the tofu (wicking off excess soy sauce) to pan and leave it to fry for about 3 minutes per side (do not touch when it is frying). Add more oil if necessary. you don't have to be vegetarian to love this! When the tofu is nicely browned, add the rest of the marinade. Serve as is, or with some toasted bread, rice or noodles (preferably soba). I gave in to my son’s craving for blood-y meat! The red meat lovers who read my blog will be happy with this one. The only person in our house who loves cow is my son, so it only makes an appearance every now and then at the Crappy Kitchen. 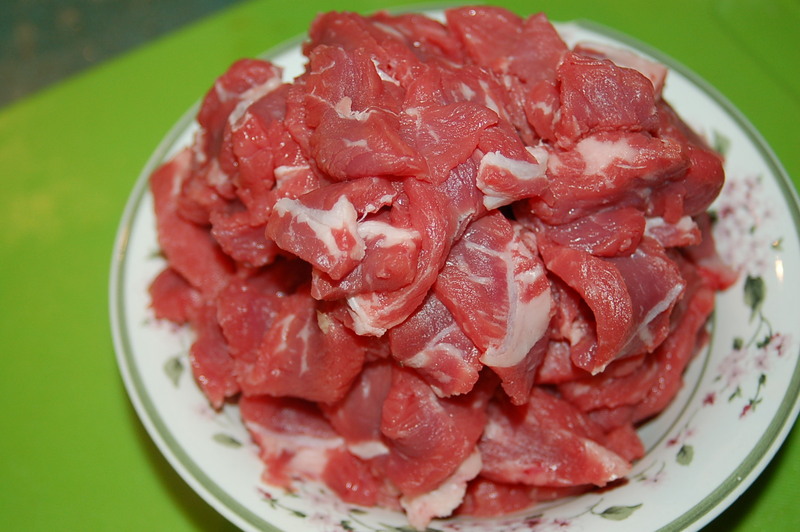 So, on the rare occasions that I do cook beef for dinner, I buy something luscious, and try to use ingredients that bring out the best qualities of the meat. This stir-fry hit the nail on the proverbial head! I am not eating beef at the moment (look at blood type A at the top of my blog for more info. ), but being the cook, I did have to taste it for flavoring etc. It was so good I wanted to forego my diet for the evening and dig in with the rest of the family. My son had two huge bowls. Always a good sign! 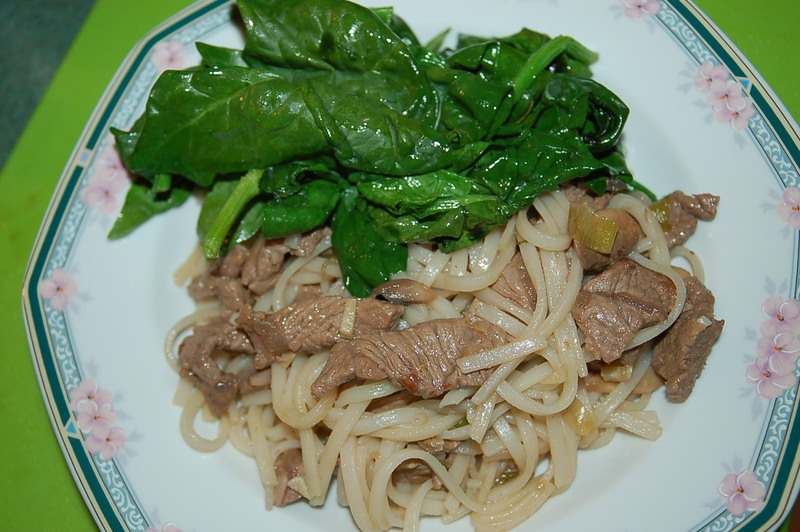 You will need: 3 tbs canola oil (or other neutral smelling oil), 1 1/4 lbs sirloin steak, thinly sliced, 3 or 4 scallions, including green parts, sliced, 8 oz white mushrooms, thinly sliced, 4 cups spinach, roughly chopped, 4 tbs soy sauce, 3 tbs mirin, (see pantry for what this is), 2 tbs rice vinegar, 2 tbs lime juice, 1 tsp sugar, 1 tbs freshly grated ginger (the finest setting you have), 8-10 oz wide rice noodles (ethnic section of your supermarket). 1 – Prep all veggies. Put pot of water on and cook noodles according to instruction and rinse throughly in cold water. set aside until ready to use. *The noodles need to be cooked before you start the actual stir-fry. 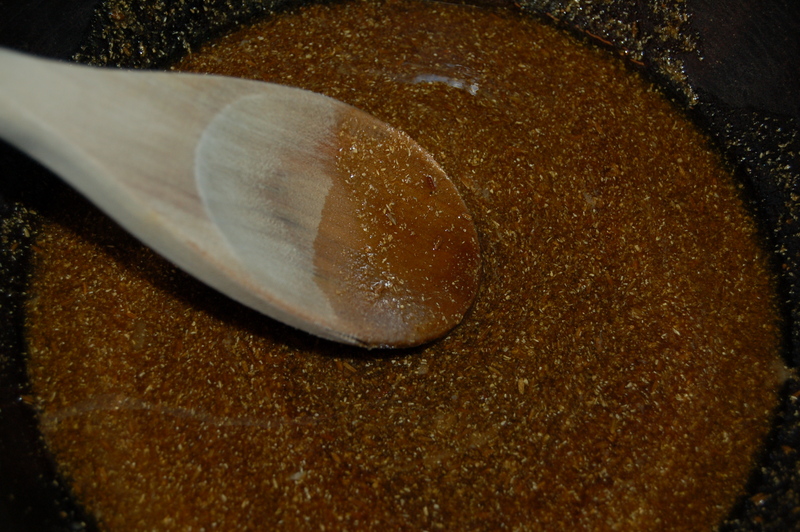 2 – In small bowl combine soy, mirin, vinegar, ginger, sugar, and lime juice. Taste mixture and add a little salt or more sugar if you think it needs it. Set aside until ready to use. 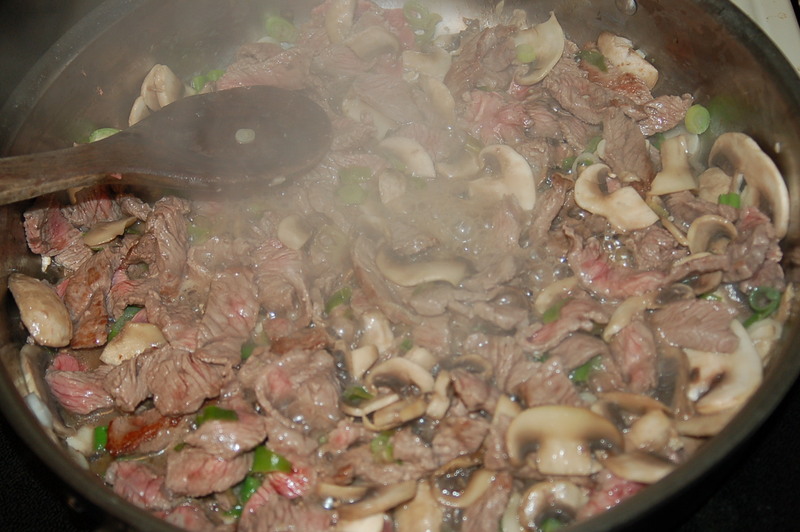 3 – Put wok or big saute pan on highest heat and wait until it is hot before adding the oil. 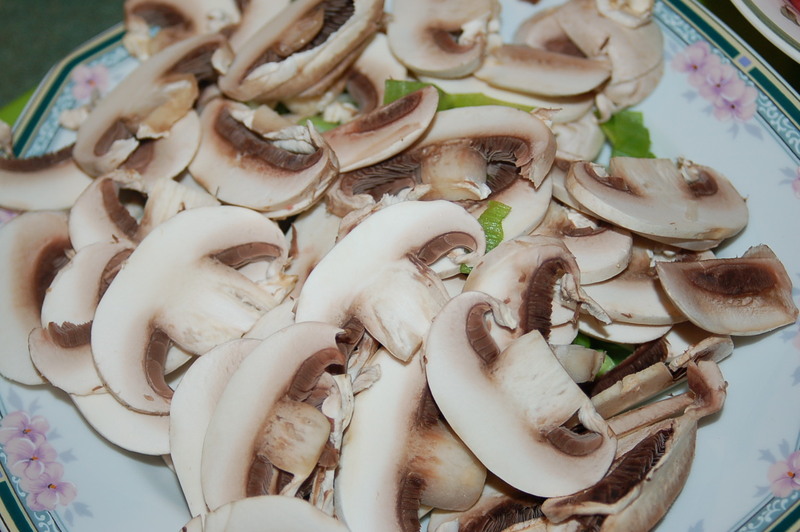 When the oil is smokey hot, add the mushrooms and cook for a couple of minutes. This releases the juices which begin to evaporate. Next add the scallions and beef (keeping the pan as hot as possible). Stir-fry the meat for about 90 seconds, stirring as needed. 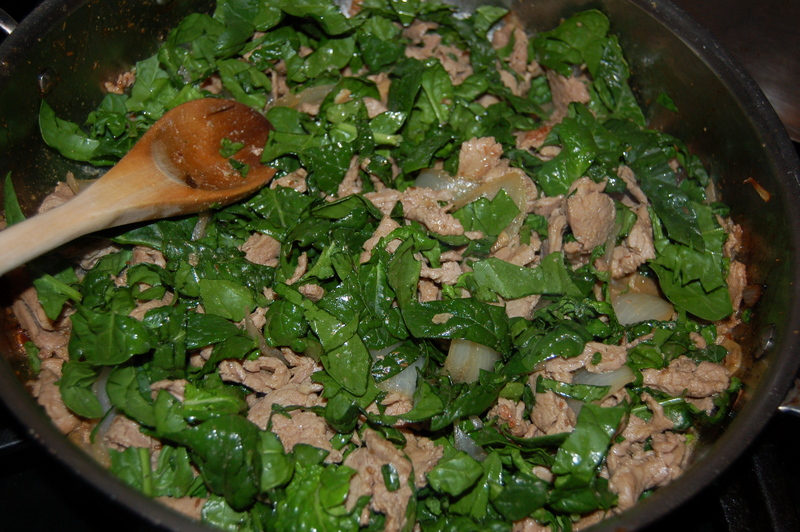 4 – Add the spinach and cook for 30 seconds. 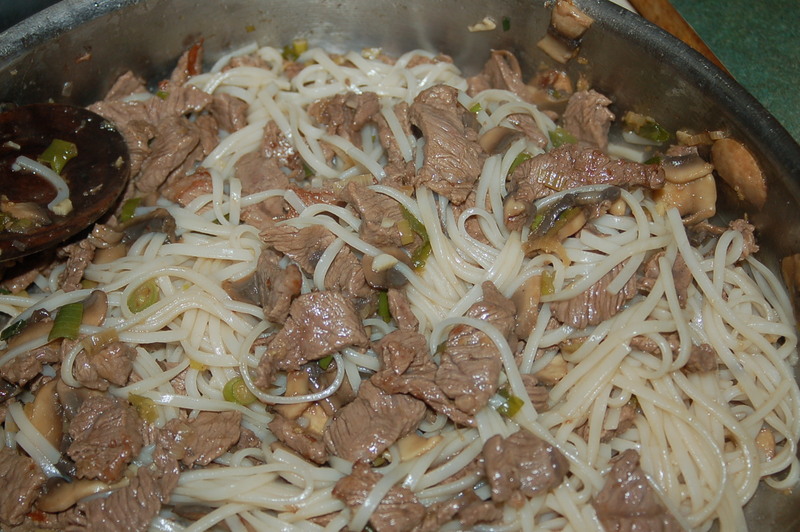 Add the liquid, followed by the cooked rice noodles. Stir until everything is hot and incorporated. Take pan off of heat. Serve immediately in warm shallow bowls with chop sticks. Why not mix Asian and Mediterranean flavors? Last night’s dinner was all about what I needed to use up. I HATE when I let greens wilt or peppers rot in my fridge! It makes me ill when I think I am throwing food out when people are starving in this world. I see so many people who toss food away without a thought. it is a disgrace and they should be ashamed of themselves. Cleaning out the fridge should meaning using up food, NOT throwing it out. The lovely greens in danger of wilting - yikes! 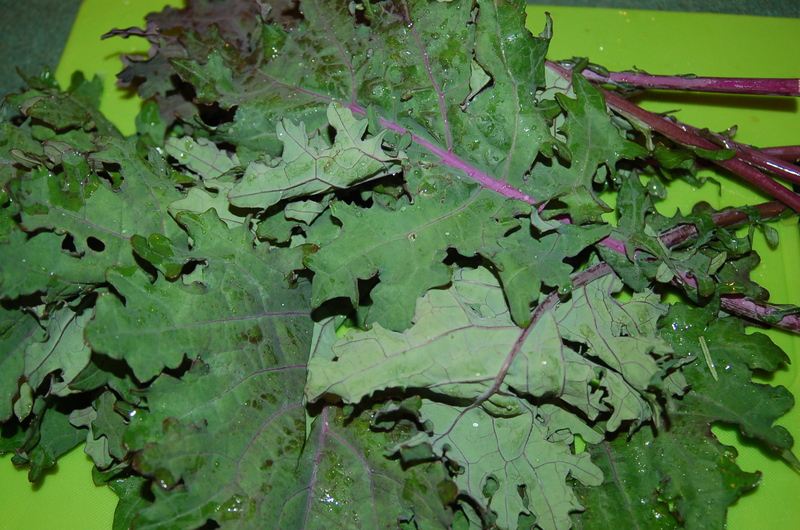 I got some fab greens in my crop share box on Wednesday (see top right of blog of more information) and wanted to use them before they became droopy and sad. This doesn’t take long, so I knew they would be part of our dinner last night. 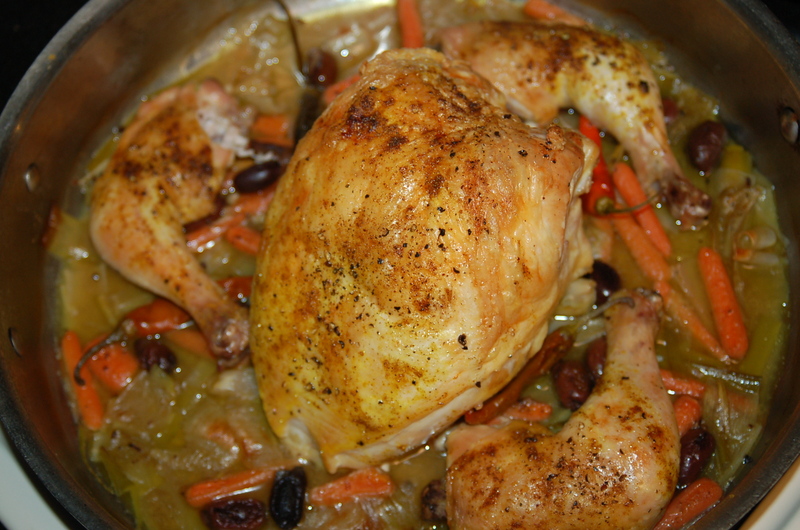 It just so happens that it were the perfect fit for the chicken dish which contained black olives; a nice salty and sweet combo. I roasted the chicken parts (legs and whole breast) on a bed of locally grown leeks, and rounded it out with the last of a jar of olives, a handful of baby carrots and a mushroom stock cube. I served it all with penne pasta, which you certainly do not need to do (my continually growing children kindly asked for it!). So, if you have some collard greens and are puzzled, or afraid of them; make this dinner. Your taste buds will be very happy! For the Chicken; You will need: 1 whole chicken breast, bone-in, skin-on (or two halves), 3 whole chicken legs, 1 cup black olives (I used greek), 3 leeks, including some of the green, sliced and washed throughly, 1 cup baby carrots, 1 mushroom stock cube (I used Telma brand), OR, 1 chicken or vegetable bouillon cube, 2 1/2 cups water, 2 tbs extra-virgin olive oil, 1 tsp mild curry powder, sea-salt and freshly cracked black pepper to season meat. 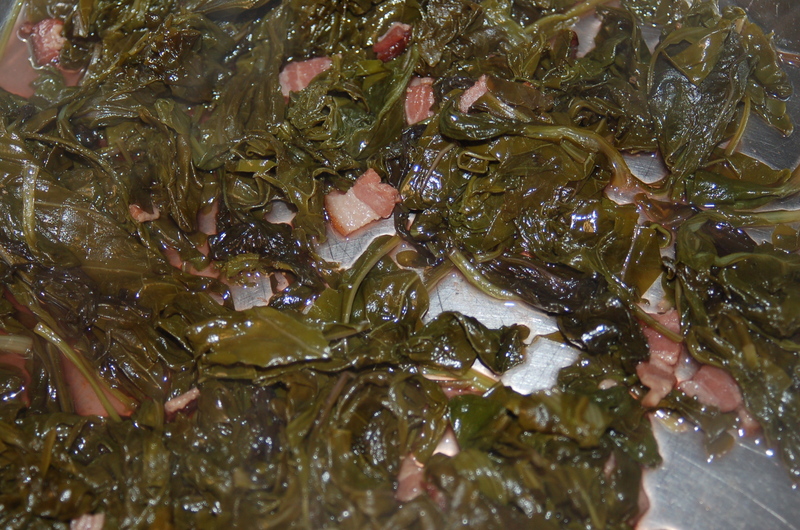 For the Asian Greens; You will need: 1 big bunch of collard or mustard greens, or other dark leafy green, ( I used the greens pictured above, along with a wintry salad mix), center rib removed and roughly chopped, 1 1/4 cups water, 1 1/2 tbs mirin, 1 tbs dark or regular soy sauce, 2 sliced smokey bacon strips. 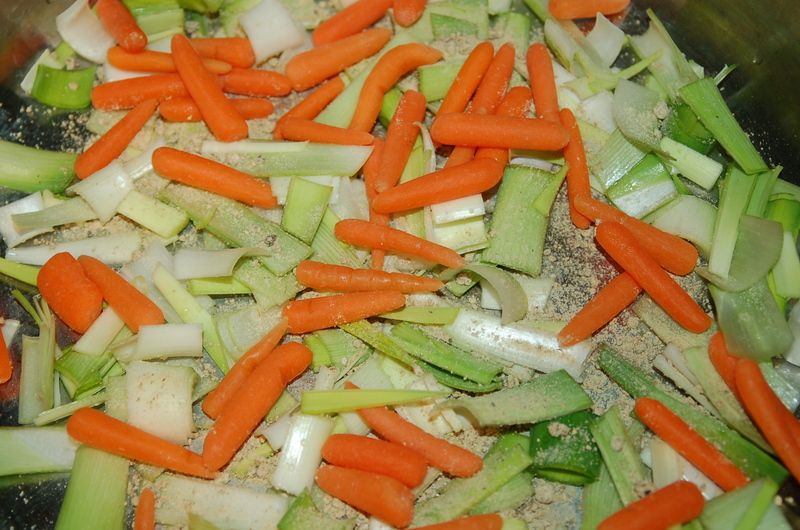 1 – Scatter leeks, olives, carrots, and crumbled stock cube into the bottom of a big saute or roasting pan. 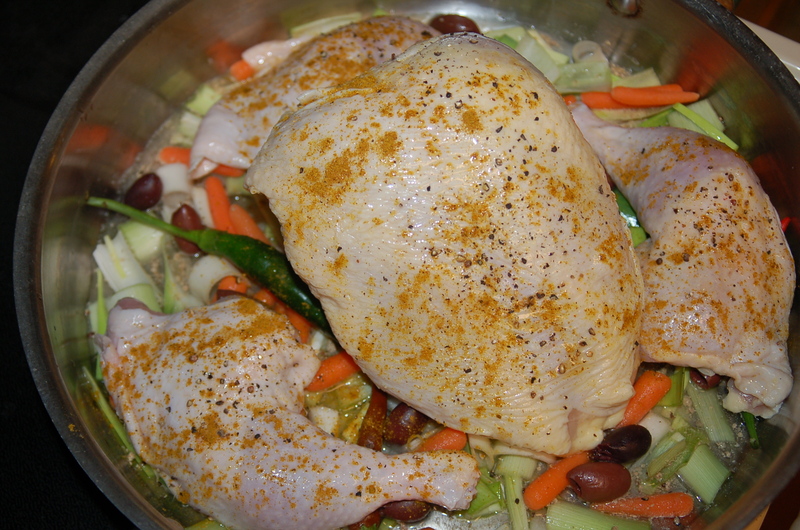 Lay the chicken pieces on top, and spread the olive oil over the skin with your hands. 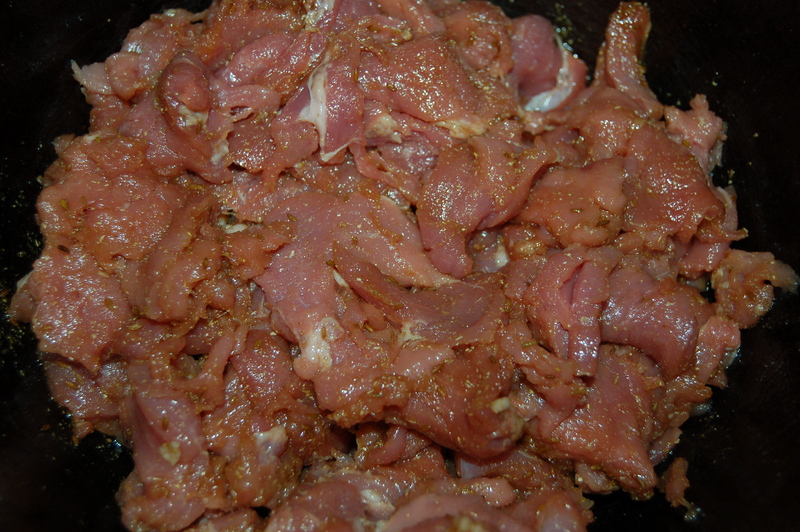 Sprinkle each piece of meat with some salt, pepper and the curry powder. 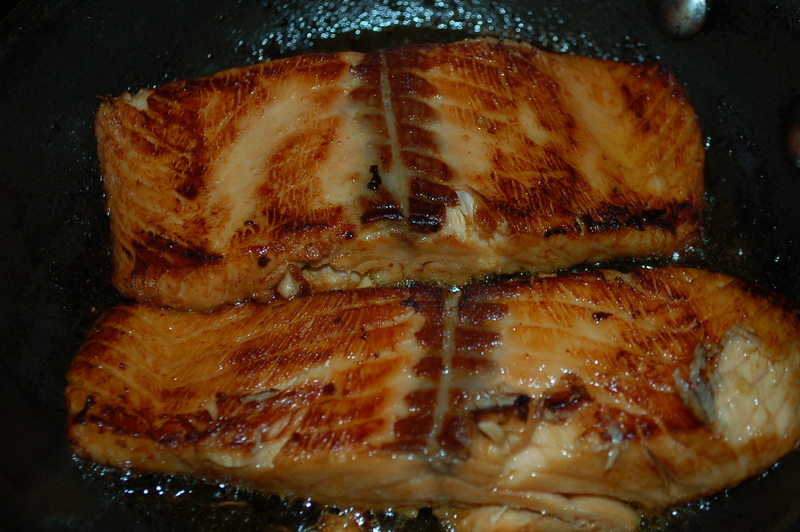 2 – Place the pan in the oven for 35 minutes. Take out and baste chicken with the liquid. Turn heat down to 400* and cook for another 30 minutes. 3 – Remove pan from oven and place chicken on a plate, cover, and rest for 5 minutes. 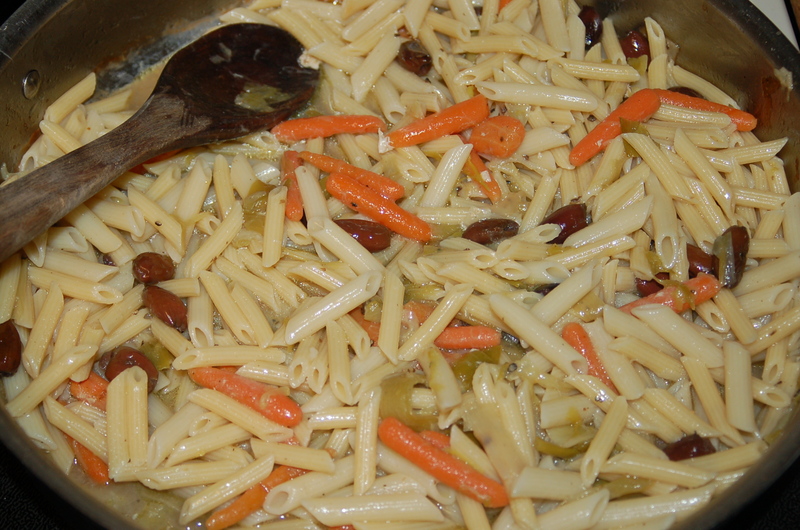 Add the cooked penne to the sauce, and keep warm until ready to serve. 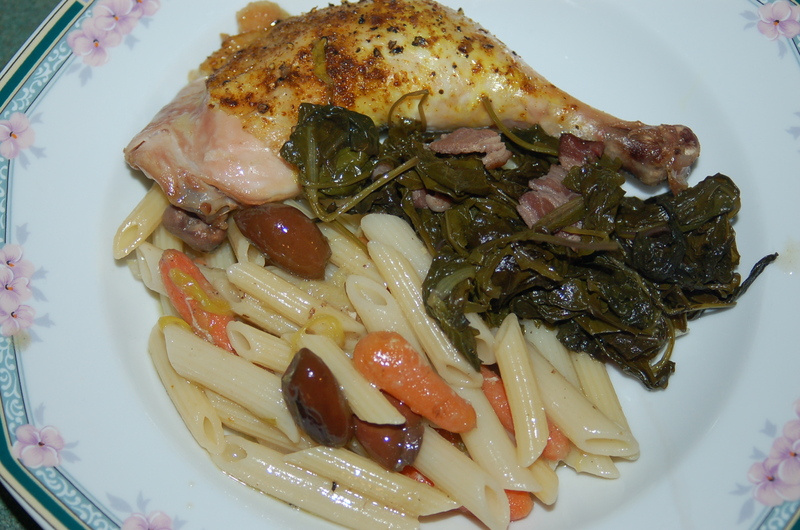 While the chicken is in the oven, cook the greens and pasta. Time the pasta to be ready when the chicken is done. 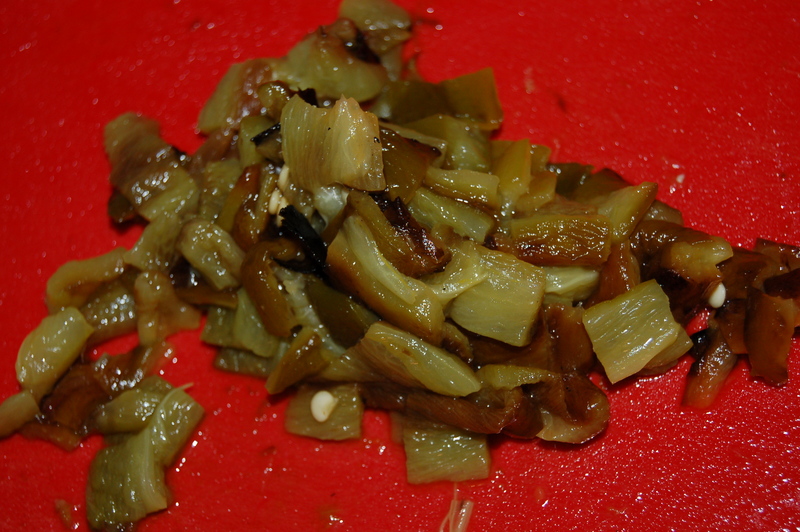 2 – Add the green to the pan and stir until they start to wilt. Add the water, soy and mirin and when everything comes to a simmer, put the lid on and cook on low, braising the greens for about 35 to 40 minutes. 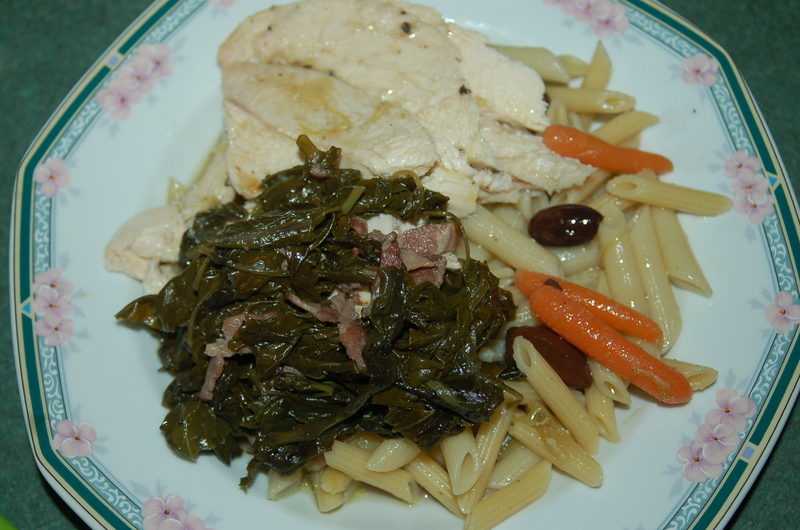 Divide juices and pasta between shallow bowls, adding either whole or sliced pieces of meat (I sliced the breast and left the legs whole) and topping with some sweet greens.